WXCU, Capital’s student-run radio station, was recently nominated for two awards from the Intercollegiate Broadcasting Systems (IBS). WXCU was nominated for Best Streaming/On-Line Only Station. Alex Caperton, a senior electronic media and film major, received a nomination for Best Specialty Show for his show ‘Mid Day Mid Week Classics and Classic.’ During this show, he plays classic rock for one hour and reads classic literature for the other. For WXCU manager and Capital alumnus Ben Ferree, these nominations could have a significant impact on the way radio is perceived, especially at Capital. The last major award WXCU received was in 2007 for Best Student Run Online Radio Station from the College Music Journal (CMJ). When seniors Maura O’Donnell and Ryan March first joined the management team during their sophomore years, WXCU’s radio station needed some improvement. March took matters into his own hands by learning website coding and taking marketing classes to create a better website and brand for the station. O’Donnell took on the role of event planner and created on campus events to promote the station. “When I joined, the reactions ranged from ‘what is WXCU?’ to ‘oh, that radio station’ like [in] disgust” March said. O’Donnell agreed and said the main reason she wanted to be on the management team was to change the reputation of WXCU. Due to their hard work and commitment, along with other members of the management team, WXCU has started to receive more recognition. 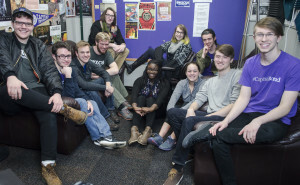 In the spring of 2015, student government recognized WXCU as one of their organizations of the year. After receiving the nomination from IBS, O’Donnell mentioned that it was even better to have the recognition on campus. Caperton joined WXCU his junior year wanting to learn more about radio. Caperton came up with his show after his first semester with WXCU, when he felt like he could do something that hadn’t been done before. Many of the classics that Caperton reads during his nominated show are from the post-Civil War era, specifically Ambrose Bierce and Edgar Allen Poe. You can tune into Caperton’s show at noon to 1 P.M. on Wednesdays and 4-5 p.m. on Mondays on wxcuradio.com.